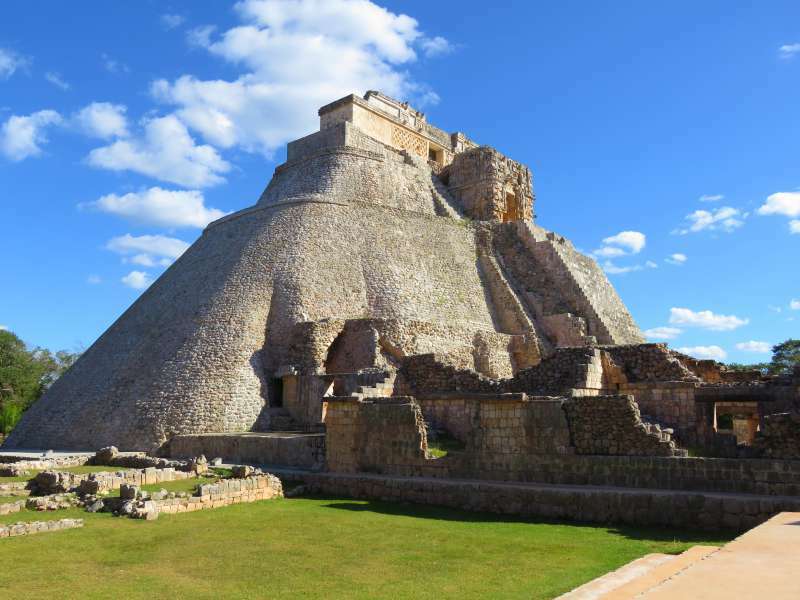 For sheer size and grandeur the Mayan ruins of Uxmal and their imposing Pyramid of the Magician are hard to beat. 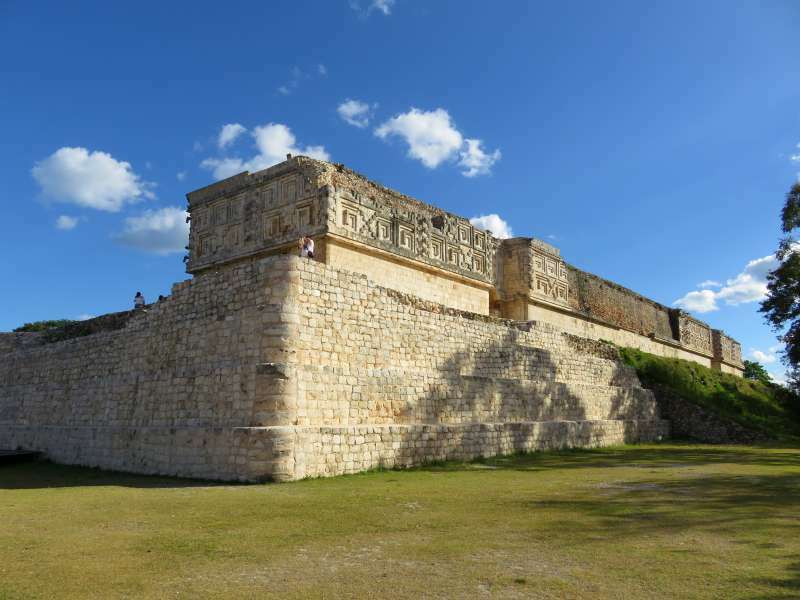 Four hours by road from the beach resorts of Playa del Carmen, Uxmal's relative isolation means that like the pyramids and temples at Mayapan it doesn't suffer from the crowds which flock to Chichen Itza and Tulum. Our road trip through the Yucatan Peninsula took us to Merida, to see the flamingos of Celestun and from Merida it was an easy one hour's drive south to Uxmal. 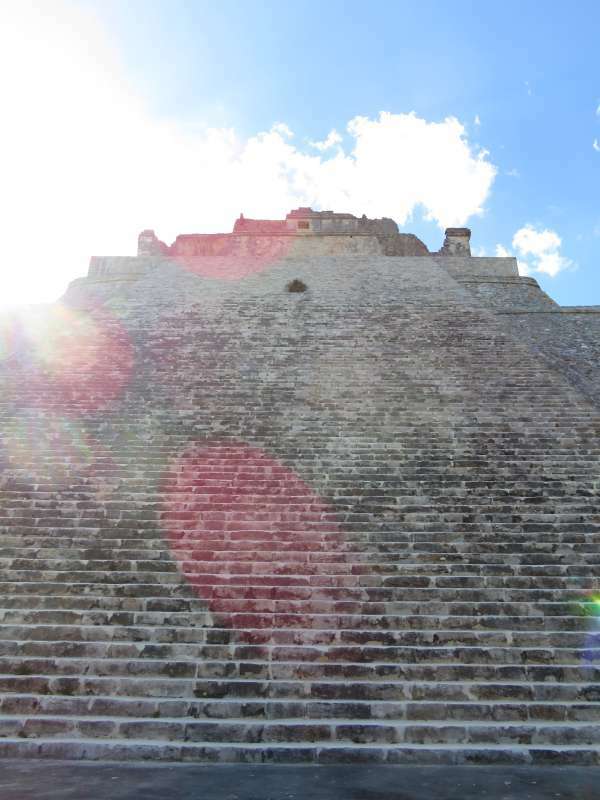 Uxmal has the most impressive pyramid we saw in all of Yucatan. Rising up on a massive elliptical base The Pyramid of the Magician is reminiscent of a fortified European castle standing in silent defence of the city's long dead inhabitants. 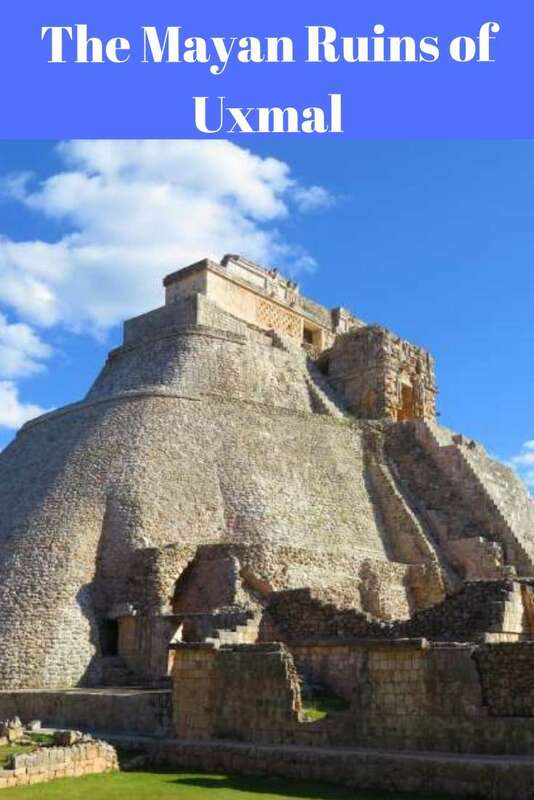 Founded about A.D. 700 Uxmal (pronounced - ooshmahl) was a city-state of 25,000 inhabitants which dominated the region between A.D. 850 and 900. Some time after the 10th Century it was abandoned and by the time of the arrival of the Spanish, it was no more than a place of pilgrimage. Unlike most Mayan city states in the Yucatan, Uxmal had no nearby cenotes or other sources of water. It relied on rainwater collected in aguadas (natural holes in the ground) and chultunes (cisterns built into the ground). Unsurprisingly Chaac, the god of rain figures significantly in the carvings which adorn Uxmal's temples pyramids and other buildings. The staircase on the Pyramid of the Magician rises at a 60 degree angle. Uxmal's tallest and most distinctive structure, The Pyramid of the Magician dominates the site with its huge base and 38 metre (125 feet) height. According to local legend the pyramid was constructed in a single night by a dwarf who was given the task in order to avoid being executed. He completed the pyramid, his life was saved, and he became the new ruler of Uxmal. Whether you choose to believe the legend or not you have to admit that The Pyramid of the Magician is a catchy name. 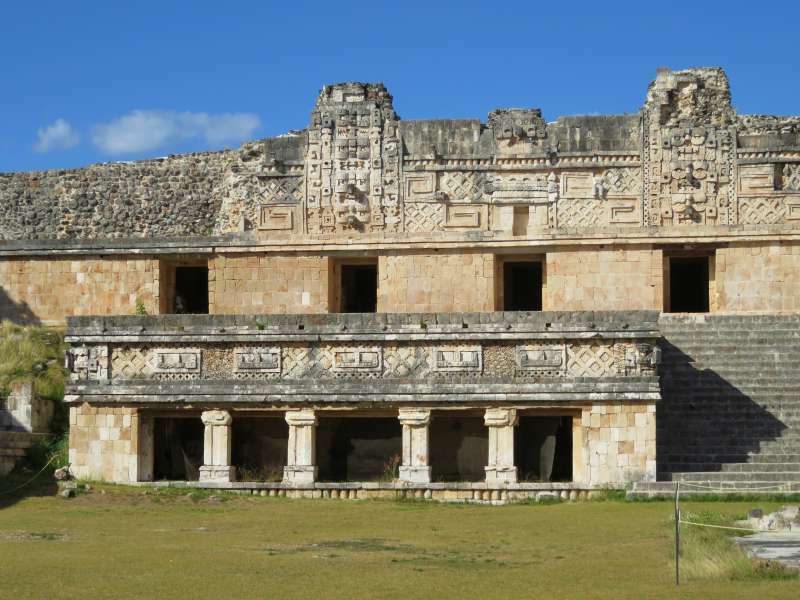 In fact Uxmal has cornered in the market on great names in this part of the Yucatan with buildings such as The House of Turtles, The Temple of Doves, The Quadrangle of Nuns, The Throne of the Jaguar and The Great Pyramid - although I am pretty sure that one has been used before! Note: Visitors are not permitted to climb the Pyramid of the Magician but there are plenty of other structures including The Great Pyramid to climb. Wear a hat, carry water and apply sunscreen. There isn't much shade. Take lunch with you. Apart from toilets there are no facilities. If, like us, you aren't keen on crowds this is a great place - there aren't any. There is a sound and light show in the evenings. We didn't stay for the show so I can't tell you anything about it. You might want to check that there is an English commentary though. Uxmal has a number of nearby hotels if you want to stay close to the ruins. We stayed in Merida at the Hilton Garden Inn. It is very new and easy to get to if you have a car. Its proximity to the ring road makes it ideal for excursions. However if you crave old town atmosphere and the ability to walk to restaurants in the evening then this isn't the hotel for you. Mayapan: Chichen Itza without the crowds. If you would like to follow our travels, check back occasionally ( I usually publish a new post once a fortnight) or enter your email address in the 'Never miss a post: Follow by email' box in the right hand sidebar just below my profile picture. I promise that there is an unsubscribe button if you get sick of us. Have you ever been to Mexico? David and I loved it. Not being able to climb them wasn't a big issue for us. I know a lot of people like to but just looking up from the ground was stunning enough. Beautiful Lyn and so cool no need to worry about hoards of tourists overrunning the place. I appreciate tourist spots being popular but tough to enjoy the experience with all the racket. There are some places, especially in Europe, which are so crowded I wouldn't go back. Give me an undiscovered spot any day - Mexico's Yucatan Peninusla is full of them. What an amazing looking place. Made sure to pin this to remind myself that I have visit here one day. Thanks so much for sharing and for taking such fantastic pictures. You have a photograph of Chichen Itza on your home page, I thought you were always two steps ahead of me when it came to Mayan ruins - lol! There are so many ruins in the Yucatan Peninsula which fly under the radar. It is an amazing place. Wow this one seems ten times more impressive than all the other ones I've ever read about! It's gargantuan! Would be fascinating to see! Thanks for linking up with #TheWeeklyPostcard! My favourite Mayan ruin is still Coba (I wrote about it last week) but Uxmal comes in at a close second. Oddly enough, we read about Uxmal on the way to Chichen Itza, and thought, "Now you tell us!" ;) Not that Chichen Itza was unbearably crowded, and we're glad we went. But we would love to have had more time for another day trip - and this is where we would have gone! As they say, there's always next time! Thanks for all of the details - very helpful! And thanks for sharing with us on #WeekendWanderlust. If I had a dollar for every time I read about something when it was too late to change our plans ...! Like you I didn't find Chichen Itza too crowded. Sure there were tourists around but compared to the big sites in Europe it was deserted. These ruins are spectacular especially that Pyramid of the Magician. I haven't heard of it and I guess it's a good thing that it's not as popular as Tulum and Chichen Itza just yet. We've only been to Tulum but this would definitely make the list the next time we're in the area. These look much more impressive than Tulum. Tulum is spectacular because of its position next to the sea but I found it hard to find a spot to recreate the angle you see it from in photos. Uxmal is amazing no matter which angle you look at it from. Wow; what a find. 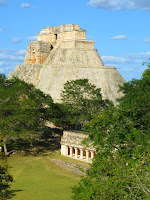 I had never heard of Uxmal Mayan Ruins. It is so grand and beautiful. It's good to know too that there aren't any crowds. That's always a plus in my book. David and I hate crowds. That is the main reason why we stopped going to most of Europe years ago. Wow, beautiful photos! I went to the Yucatan as a kid, but to be honest, I can't even remember exactly where we went! 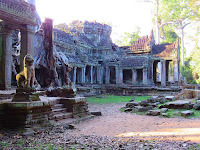 Would love to go back, such a fascinating history and culture. I went there this year and I already want to go back! The Pyramid of the Magician is indeed magical...60 degree angle! Merida seems to be a better base than Cancun to see all the history of the Yucatan! We went to Cancun. We aren't really beach people so we flew in and out of Cancun but didn't stay there. We stayed at Chichen Itza, Merida, Valladolid and a hideously over-priced 'luxury' boutique which I don't want to name. These destinations made for a great road trip to see Mayan ruins. We stayed right in Uxmal and were able to walk to the ruins as well as the Choco/Story Eco Park that were adjacent to the lodge we stayed in. I loved exploring this part of Mexico. Haha - I had to laugh when you mentioned chocolate. Trust you to find a chocolate angle. I wish I had known about the Choco/Story Eco Park before we went. I definitely need to pay more attention to your blog. I love this legend of the dwarf who built the pyramid only in one night to save his life. 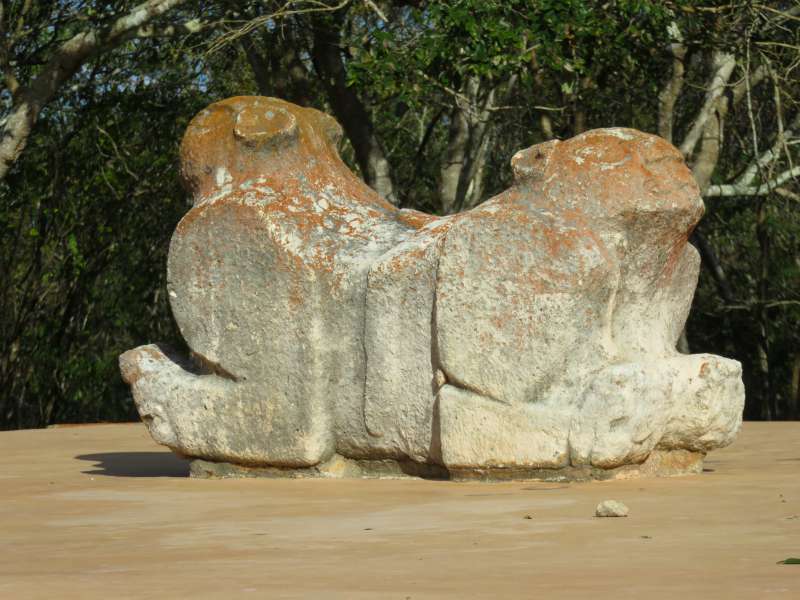 As a ruler of Uxmal I'm sure he was able to get even with his adversaries! Haha - I hadn't thought of that. Uxmal looks like a great stop, and I like the idea of the drive through the region, including Mérida. It's a fascinating part of the world; I have half a mind to move there. Pinned. If you are thinking of driving through the Yucatan Peninsula keep an eye out for my round up post on our Yucatan Peninsula road trip. I will publish it in the next couple of weeks. The Pyramid of the Magician is huge. I have never seen a Mayan structure this big. It also looks to be complete and in very good condition. The story about the dwarf building this in a night sounds very familiar to a story I just heard in American Samoa about a race of small people building a royal fishing pond overnight. The Pyramid of the Magician is seriously impressive - well worth visiting.